I’m still on what seems to be a never ending quest for the best carrot cupcakes — a recipe so good I’ll stop looking for others. Those recipes are hard to find for avid recipe collectors, but every so often I do stumble upon the “perfect” recipe and stop looking. Just not often. 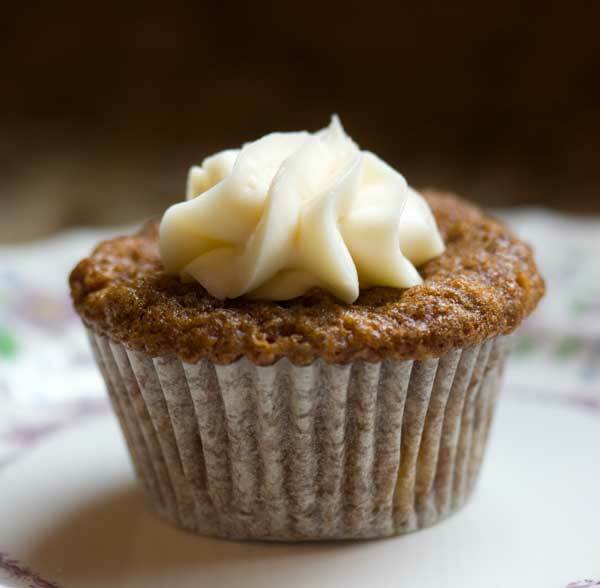 For the “best carrot cupcakes” the qualities would be sweet, but not cloying so; dense rather that light, and stuffed with lots of nuts, pineapples and maybe even a golden raisin or two. To start, I’ll tell you a little about this weekend’s cupcakes which were made with one of the most ubiquitous carrot cake recipes out there. You may recognize it as the one that calls for 2 cups of flour, 2 teaspoons of baking soda, 2 cups of sugar, and the 1 1/2 cups of oil that people just love to cut in half or replace with applesauce. The only place where I could find reviewers who mostly stuck to the recipe was King Arthur’s site. King Arthur’s recipe uses the same proportions as this one, though they use granulated sugar in place of brown and throw in other spices. So here’s the recipe as I made it. I used a mixture of melted butter and oil for the fat, kept the spice to just one (cinnamon), and added pineapples and finely chopped nuts, which are definitely a prerequisite to my ultimate carrot cupcake. These cupcakes are quite good, though a little oily. I wouldn’t make them for myself on a regular basis, but for a special occasion or an event where you’re competing with bakery cupcakes and need to go all out, the 1 1/2 cups of fat comes in handy. This recipe is also super easy because you just stir everything together in a bowl. So are they the best carrot cupcakes? Well, they are very good! You’ll have to try them and let me know. In a medium bowl, mix together the flour, baking soda, salt and cinnamon. Set aside. In a large bowl, whisk together the eggs, brown sugar and vanilla. Add the oil and melted butter and stir until mixed, then add the flour mixture and stir until mixed. Stir in the carrots, nuts and pineapple. Line about 32 cupcake cups with liners Bake at 350 degrees for 20-24 minutes, or until they are golden and a toothpick inserted into the center comes out clean. I love Ina Garten’s Carrot Cupcakes, whenever I make it I lessen the sugar and I use joyofbaking.com Cream Cheese Icing. I love carrot cake! One of my favorites. Can’t wait to see what you come up with! The only carrot cake I’ve ever made is the Silver Palate Cookbook cake. We like it a lot. good luck with this quest! I guiltily raise my hand as one of those people who likes to replace some of the oil with applesauce or Greek yogurt. But I swear, I can’t tell the difference. My favorite carrot cake was one they used to serve at a cafe near my university that was not very sweet, probably had molasses, was full of raisins, and had cream cheese icing that was super-rich but had almost no sugar in it. I wish I could tell my student self to ask for the recipe! 2. King Arthur’s Kitchen Sink Carrot Cake ( a lot like the one in this post, but with less sugar and some baking powder. 3. Sam’s Carrot Cake (on allrecipes.com and in Southern Living – -the one with buttermilk). 4. Rabbit’s Carrot Cake from The Fanny Farmer Cookbook (Made in food processor, has baking powder, supposed to be crumblier that the others).